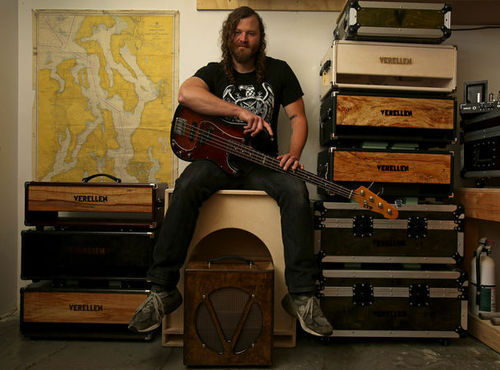 Made in Seattle, Part 5: An electrical engineer by training and a guitar-heavy musician by passion, Ben Verellen creates custom amplifiers in his Fremont workshop, seeking a certain Platonic guitar sound. Orange hair spiraling everywhere, Viking-looking Ben Verellen perches on a stool in his Fremont workshop behind the High Dive music venue in Fremont, detailing his intimate relationship with guitar amplifiers. Verellen is something like “Beast” from the X-Men — hard-core appearance, but a sweet and professorial demeanor. At night, fronting his band Helms Alee, or playing drums in Constant Lovers, he’s all rock and rough. During the day, he meticulously crafts custom amplifiers at his company, Verellen Amplifiers, making setups customized to players’ specifications, one at a time, and completing all the wiring by hand. Today at headquarters, the mood is serene, two rooms full of ruggedly handsome amps in various stages of doneness, dark wood branded with block letters — “Verellen Amplifiers.” The wood — mostly Baltic birch, which is typical for amps, or spalted maple, which is unusual, attractive but technically diseased and riddled with black lines — comes from Tacoma, from Verellen’s partner and friend Mike Erdman. His goal is high-quality units priced as reasonably as possible. The standardized Meatsmoke is popular for Verellen, but he has also developed a following because he’s willing to interpret a musician’s vision for an ideal amp, build it, troubleshoot it and find a way to make it work the way the client wants at an affordable price. “Amplifier,” you may know, is the common name for the luggage-sized box into which one plugs an electric guitar. This object receives a signal from the instrument and sends noise through a speaker. But the amplifier is not in fact the whole speaker-containing cabinet. It is a smaller component connected inside the cabinet, or sitting on top as a separate box. It represents a crucial, flavor-gathering stop along the electrical route which manipulates electricity through either modern transistors/semiconductors (most amps), or the purist’s choice — and Verellen’s stock in trade — glass vacuum tubes. Today, tube amps are a cottage industry favored by players who say they impart grit and heft to their instrument’s sound. Verellen draws no such lines. But he does believe vacuum tubes produce special sounds. He picks up a small glass tube and squints at it. It looks like a light bulb. He says if you looked closely at a tube in action, you’d see thin metal prongs and a little filament glowing hot orange. That orange filament boils off a cloud of invisible electrons inside the glass. Applying voltages attracts those electrons to the pieces of metal, and increases the flow of electricity through the tube. Verellen admits to seeking a certain Platonic guitar sound, though he can’t define what it is exactly. And then there would be Verellen, his amps standing out because they look less like midcentury-modern furniture and more like leather and burnt wood. A lifelong tinkerer, Verellen holds an electrical-engineering degree from the University of Washington. At the end of that academic path, though, he took a sharp left. When most of his peers graduated and took $80,000-a-year entry-level jobs, which meant working on someone else’s big project, Verellen instead became an entrepreneur. Otis became one of the initial investors who helped Verellen start building amps as a full-blown business. Those naysaying professors were mentoring from a realistic place, arguing that engineers’ jobs are to make systems smaller, lighter and more efficient. But Verellen was more into art. It’s true, the music he helps bring to the world is often loud, but he’s not out to dominate anything. He’s going to keep tinkering, including with some tube-amp systems for turntables and MP3s played from phones, but guitar amps will remain his primary jam.